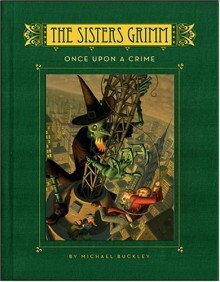 In the long-awaited fourth book in the New York Times bestselling series, the Grimms take on New York City! Surprises abound for Sabrina and Daphne Grimm, fairy-tale detectives extraordinaire. When they venture into the big city, they stumble upon a murder, face betrayal by a friend, and discover an amazing secret about their mother, Veronica. Sabrina just wants to be normal—no detecting, no dangerous escapes, and especially no Everafters. Unfortunately, New York City is a hiding spot for many famous fairy-tale folk. And there’s a murderer in their midst! The girls and their friends must figure out who killed Puck’s father, King Oberon, while coming to terms with their mother’s secret life. Will they stop the murderer before he or she can strike again? And will Sabrina ever accept her family’s destiny? The colorful world of the Grimms expands in new and hilarious directions in Once upon a Crime. Critics and readers alike have embraced the Sisters Grimm series and its independent, quick-thinking heroines. http://degreesofaffection.booklikes.com Degrees of Affection 3.0 Once Upon a Crime (The Sisters Grimm, Book 4) - This book makes me want to break out into that song from Annie, "N Y C..."
text Once Upon a Crime (The Sisters Grimm, Book 4) - This book makes me want to break out into that song from Annie, "N Y C..."
I continue to enjoy this series more and more, and I know I'll be disappointed when I finally get to the end. The only thing I don't get is why the author made a dig at Rick Warren. Wuzzup wit dat? Anyway, still a great YA series. Buckley is developing the relationship between the sisters, and making his world a little richer each time.